Ima Niboro,a former aide to the immediate past President of Nigeria Goodluck Jonathan, on Thursday,declared his intention in a Facebook post to contest under the All Progressives Congress (APC). Defecting to APC from the Peoples Democratic Party (PDP), Niboro confesses saying ” I have reached and contacts to serve the people meritoriously and i seek to represent my people ( Ughelli north/Ughelli south/Udu federal constituency ) at the lower legislative chamber. 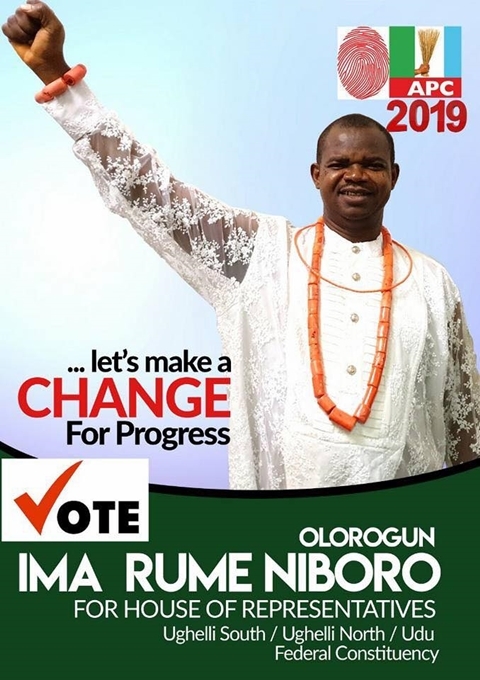 He posted his campaign poster on facebook and wrote: “I have maintained that if we are to send someone to represent Ughelli South, Ughelli North and Udu in Abuja, why not a person that can hit the ground running. “A person who knows centre and who the centre knows. A person seized of the requisite contacts and connections within the federal government. A person who has national name recognition who can rapidly use his network to bring development to our people within a space of four years. “Part of the reason our representatives have always failed to attract development to our homeland is because many of them are mere local champions. No one knows them at the centre, and the centre definitely doesn’t know them. “Before they are able to build the requisite base, four years are gone. This is why they always fight tooth and nail for a second term, and have always failed. “I have seen the immense lost opportunity we have suffered. The terrible waste of lives that should have been longer and more meaningful. The drought of ideas that have driven these losses and the sheer wickedness that sustains our pain,” he said. “I choose to run not because I believe I can solve all the problems of our people. But because I am convinced that as their representative I will be part of the solution not part of the problem as our present and some past representatives became. “I choose to run because I hold aloft a beacon of hope. A hope that beckons on our people to dare to dream new dreams on the streets and thoroughfares of Ughievwen, Udu, Agbarho, Ughelli, Ewu, Evwreni, and the hundreds of other communities where our people live, work and sire new generations. “Our communities produce oil. We play host to one of Africa’s largest gas plants. We have historically been net contributors to the sustenance of the Nigerian nation. Not only in terms of resources, but also in terms of sheer brain power. “But we have remained dirt poor. Poverty, disease and despair still stalk our land. Why is this so? It is because we have had an unfortunate disconnect. The governments we loved and were ready to die for never really loved us.